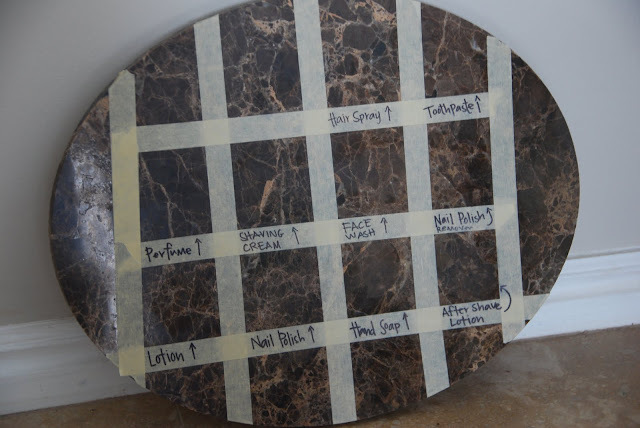 Last year I did my own experiment to show how marble etches in the kitchen. You can read Part 1 here and Part 2 here. 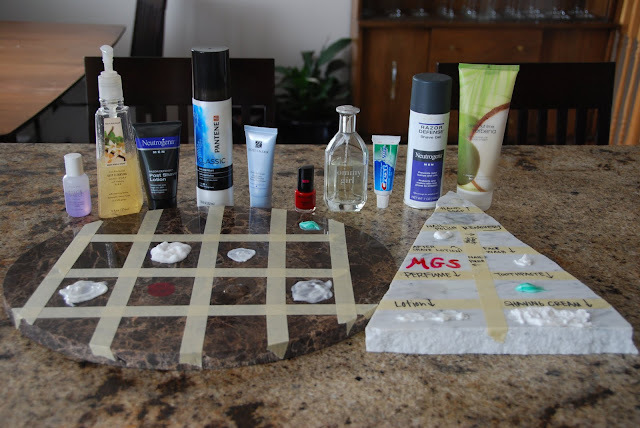 When I was doing this first experiment, after I had all the kitchen ingredients on the marble my husband asked me why I hadn't put any bathroom items on the marble. Honestly, I hadn't even thought about it. 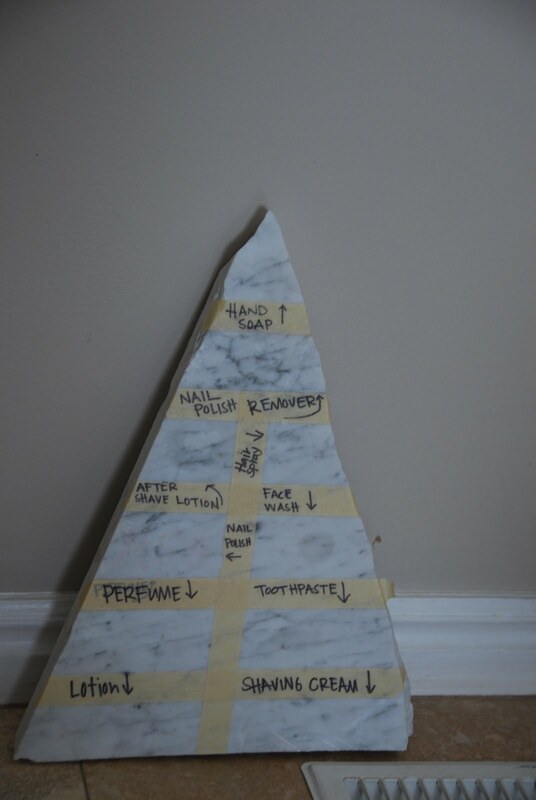 Marble is much less likely to etch in a bathroom because usually you don't have too many acids in there. I say this, but I must mention that the limestone in my own Powder Bath etched. Someone had dripped a couple of globs of Bath & Body Works liquid soap on my Seagrass Limestone countertop and I didn't notice it until the next day. When I wiped it up there were a couple of etched spots on the countertop. So, while we aren't cutting lemons in the Powder Bath there are other items that are in our bathrooms that will etch the calcium based stones. I put together a whole new test using bathroom stuff. I decided to conduct this experiment on two different marbles, Carrara and Emperador Dark. I thought it might be helpful to see the difference between a light and dark marble. I taped off sections on each marble piece and dabbed the items on. I then let them sit for about 24 hours. Obviously 24 hours is longer than most people would let red nail polish sit on their countertops, but I'm going for a worst case scenario here. The next day when everything had dried up it was kind of a pain to get off. I had to use a razor blade for a lot of it. The results were a bit surprising to me. My husband just uses an After Shave Lotion, not the liquid stuff. It's probably the liquid After Shave that I personally have had the most issues with etching with homeowner's in the past. 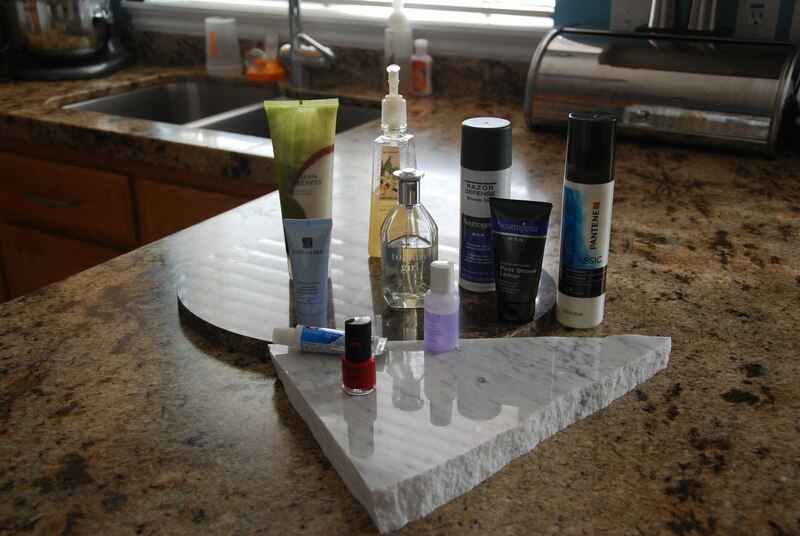 All in all I was surprised with how few of the products actually etched or stained the stones. I was quite impressed that the red nail polish didn't even stain the Emperador Dark and barely stained the Carrara! Also keep in mind that different brands of face wash, toothpastes, etc may affect your stone differently. The type of marble will make a difference as well. Great experiment! These are what our clients need to see. Thanks for all the great information you put on your blog. It's a great resource for me and my interior design business. And this is why I read your awesome blog! This is the kind of thing I need to see. Very interesting. I've always been scared away from marble and limestone. This makes me feel better about it. Now I can dream of Carrara in my Master bath again! My wife and I really want to do Carrara Marble in our kitchen and bathrooms. I just wonder if we ever accidentally leave something overnight - how would we clean up a stain? Lemon Juice and etch the crap out of it? Some grinding sander with a fine grit paper (2500 grit and water?)? We're in the planning stages to build right down in Vineyard so we may have to hook up with you and MGS. The best way to take care of marble is just to embrace the etching. 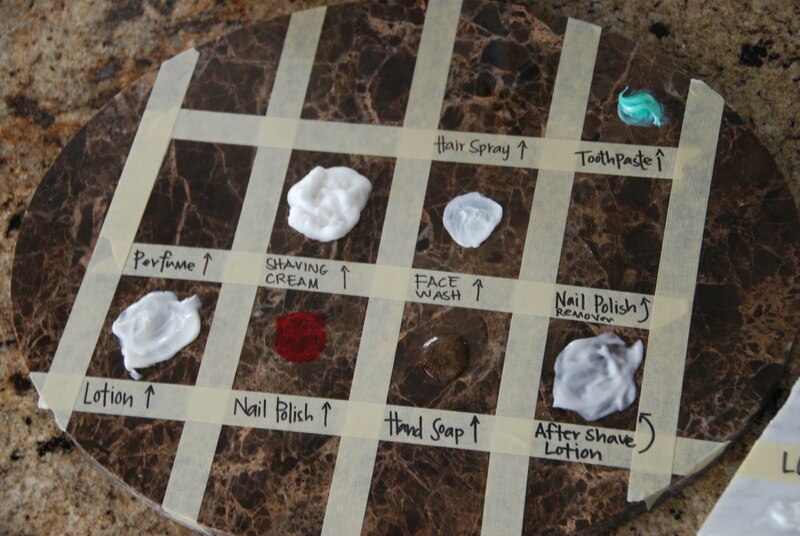 For stains we (or you) can get them out fairly easily with a poultice...store bought or even homemade. 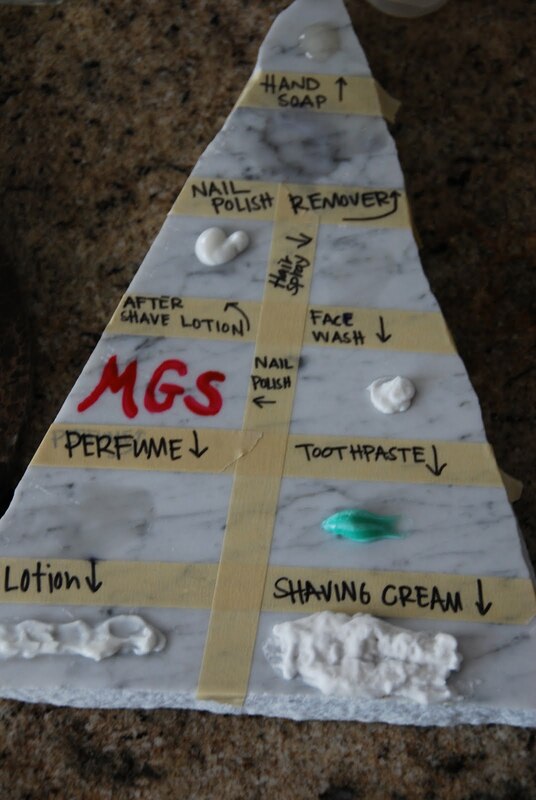 We'd love to help you out with your marble. Come in and see us! We are noticing the liquid soap staining/etching our marble as well. I bought the clear, non-scented type, but it still happens. Do you have a suggestion for what type of soap to use in the bathroom? Thanks! Any soap with acid will etch it. Look for something without any acid in the ingredients. Bath & Body Works Vanilla foamy soap has been fine for me.